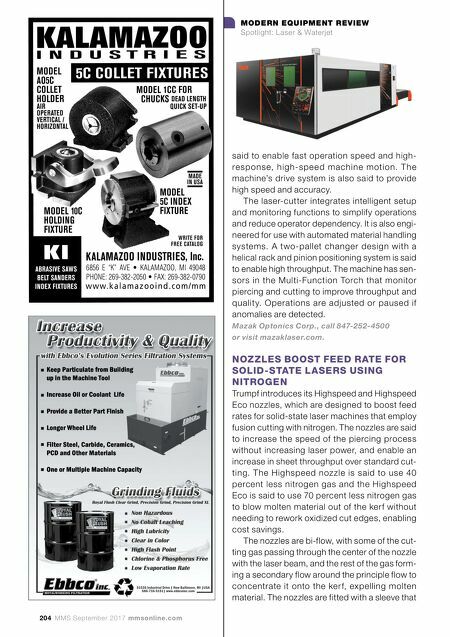 mmsonline.com September 2017 MMS 205 MODERN EQUIPMENT REVIEW Spotlight: Laser & Waterjet is designed to glide across the material during cutting, forcing gas directly into the ker f and minimizing gas flowing off to the side while keep- ing the nozzle 0.06" from the sheet surface. The nozzle is designed to withstand spatter generated during piercing, accelerating piercing and mini- mizing the risk of damage. The nozzles are capable of fusion cutting of 0.5"-thick mild steel sheets, instead of 0.4" thick as in the past. 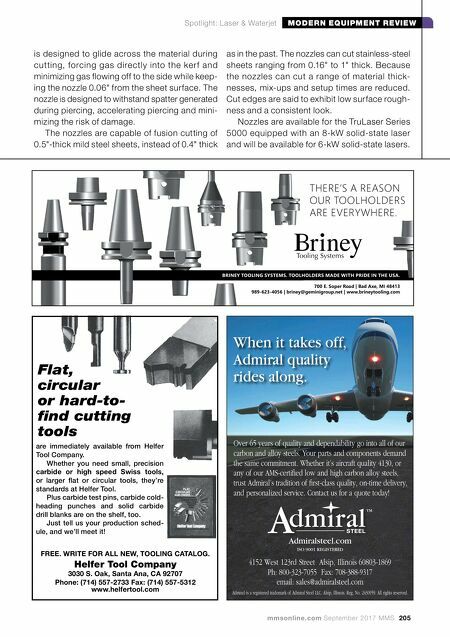 The nozzles can cut stainless-steel sheets ranging from 0.16" to 1" thick. Because the nozzles can cut a range of material thick- nesses, mix-ups and setup times are reduced. Cut edges are said to exhibit low surface rough- ness and a consistent look. Nozzles are available for the TruLaser Series 5000 equipped with an 8-kW solid-state laser and will be available for 6-kW solid-state lasers. are immediately available from Helfer Tool Company. Whether you need small, precision carbide or high speed Swiss tools, or larger flat or circular tools, they're standards at Helfer Tool. Plus carbide test pins, carbide cold- heading punches and solid carbide drill blanks are on the shelf, too. Just tell us your production sched- ule, and we'll meet it! Flat, circular or hard-to- find cutting tools FREE. WRITE FOR ALL NEW, TOOLING CATALOG. Helfer Tool Company 3030 S. Oak, Santa Ana, CA 92707 Phone: (714) 557-2733 Fax: (714) 557-5312 www.helfertool.com When it takes off, Admiral quality rides along. Over 65 years of quality and dependability go into all of our carbon and alloy steels. Your parts and components demand the same commitment. Whether it's aircraft quality 4130, or any of our AMS-certified low and high carbon alloy steels, trust Admiral's tradition of first-class quality, on-time delivery, and personalized service. Contact us for a quote today! Admiralsteel.com ISO 9001 REGISTERED 4152 West 123rd Street Alsip, Illinois 60803-1869 Ph: 800-323-7055 Fax: 708-388-9317 email: sales@admiralsteel.com Admiral is a registered trademark of Admiral Steel LLC. Alsip, Illinois. Reg. No. 2430959. All rights reserved. ™ 700 E. Soper Road | Bad Axe, MI 48413 989-623-4056 | briney@geminigroup.net | www.brineytooling.com BRINEY TOOLING SYSTEMS. TOOLHOLDERS MADE WITH PRIDE IN THE USA. THERE'S A REASON OUR TOOLHOLDERS ARE EVERYWHERE.